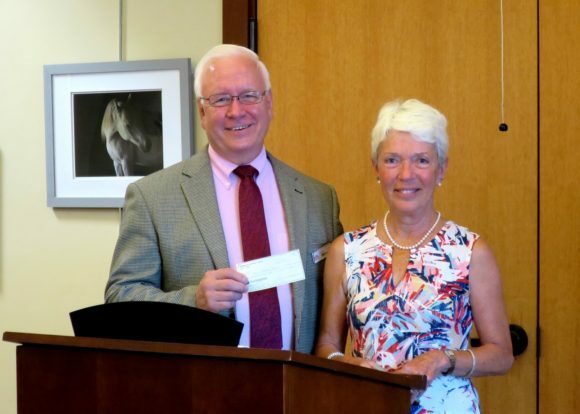 The Friends of Essex Library recently presented Library Director Richard Conroy with a $20,000 check. “Quite simply, the Library could not offer the level of services we provide if it weren’t for the vital financial support we receive from our Friends” said Conroy, who marveled at how vibrant the organization has become over the past few years. He offered special thanks to outgoing Friends President Jo Kelly for being “the sparkplug” that has kept the group on task during her tenure. He also mentioned that he looked forward to working with incoming President Suzy Baird. In addition to their usual fall and spring book sales the Friends are hard at work planning upcoming fund-raising events such as a Swallow Cruise in September, and Library Mini-Golf in January. To learn more about the Friends, or how to become one, visit their webpage at: www.youressexlibrary.org/friends/.